At number 28 in Rolling Stone Magazine’s list of the 100 greatest Beatles songs is George Harrison’s 1969 masterpiece “Here Comes the Sun”, one of my favourite Beatles songs. This song was composed by Harrison during a difficult time when the Beatles were frequently bickering. 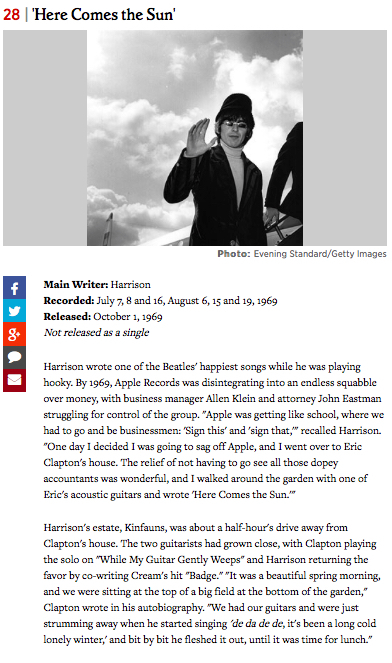 One day, Harrison decided to play truant from a planned business meeting at the band’s Apple Corps organisation. Instead, he went to see his friend Eric Clapton; the song was composed in Clapton’s garden. According to Clapton, it was April 1969. “Here Comes the Sun” was recorded over the summer of 1969, and appears as the first track on the second side of their 1969 album Abbey Road, which was released in September 1969. The song was never released as a single, although it has gone on to be one of Harrison’s best known compositions. 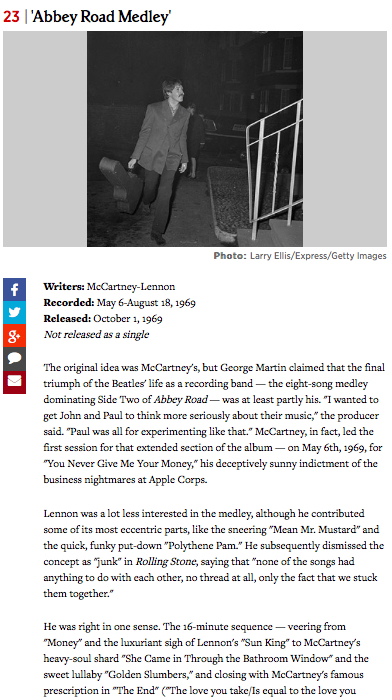 At number 28 in Rolling Stone Magazine’s list of the 100 greatest Beatles songs is “Here Comes the Sun”. I cannot find a video of the Beatles’ version of Here Comes the Sun on YouTube, but I have found this version of George Harrison performing it live in concert. Enjoy!